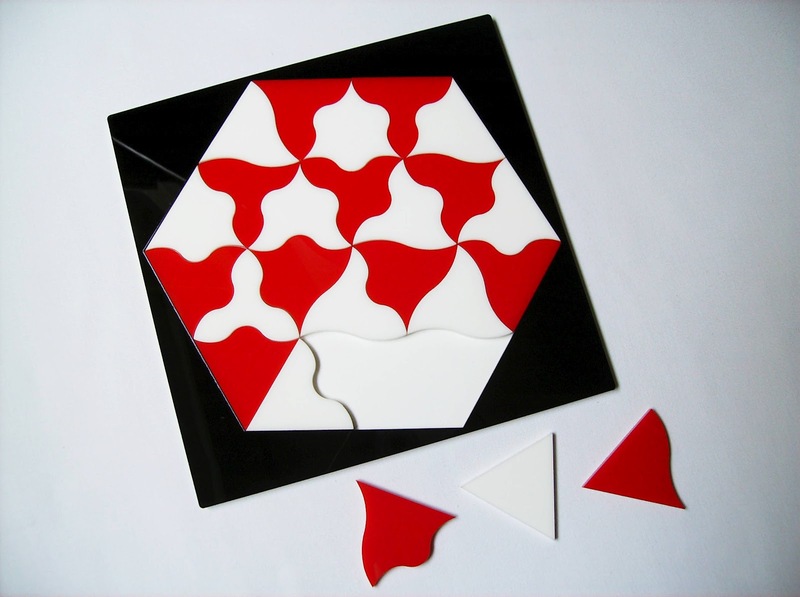 Trifolia is a wonderful edge-matching puzzle invented by Kate Jones and first published by Kadon Enterprises in 1990. 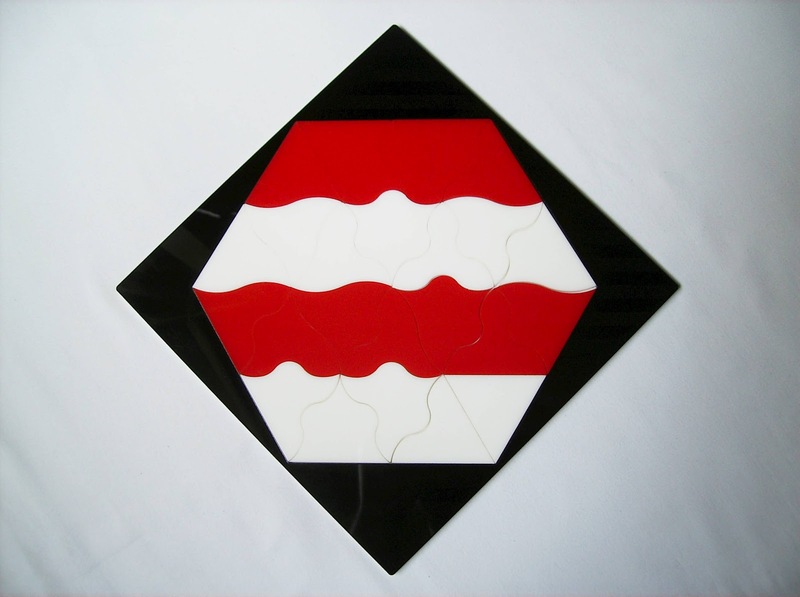 The puzzle has 24 laser-cut acrylic tiles in two contrasting colors, red and white, and they represent all possible edge type combinations, which is waves, straights, hills and valleys. Reminiscent of a M.C. Escher's painting, the puzzle is also mathematically related to another Kadon puzzle, the Multimatch III. 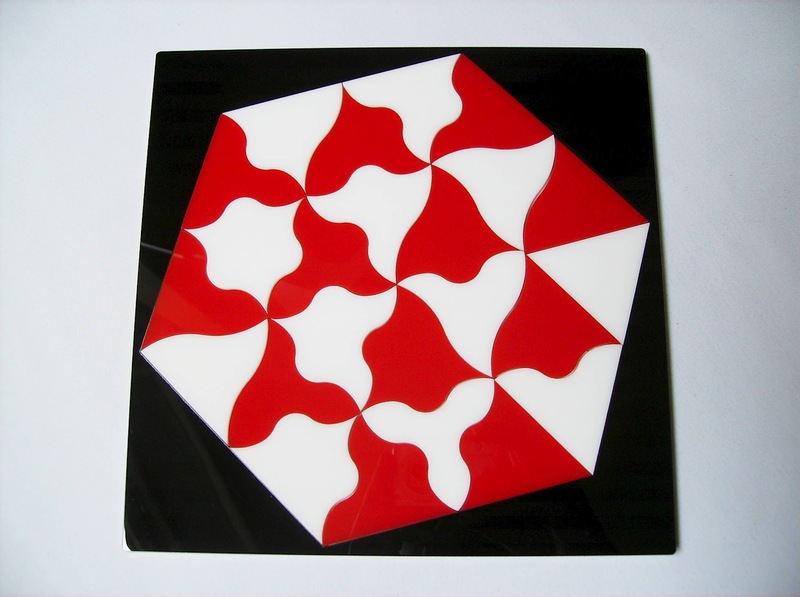 Beautifully presented in a black acrylic square tray, measuring 21.5cm in length (8.5"), the puzzle comes solved in a hexagon shape with a checkerboard color pattern. Within the hexagon shape, you have a staggering 2.3 million solutions. However, only a small fraction of that number allows for color symmetry solutions (see below photos for a couple of examples). 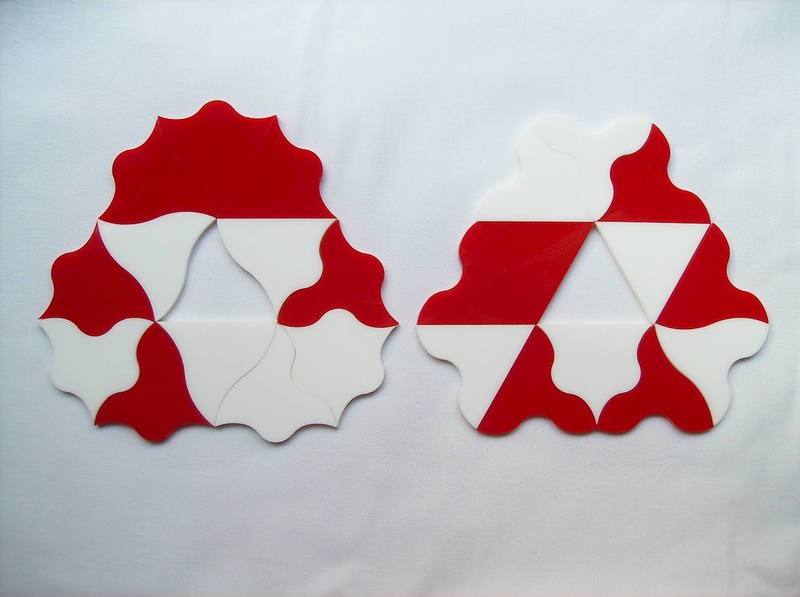 From the many possible symmetrical solutions, one of the most obvious, half white/half red, is impossible to solve, as one of tiles has to be placed on the other color half. 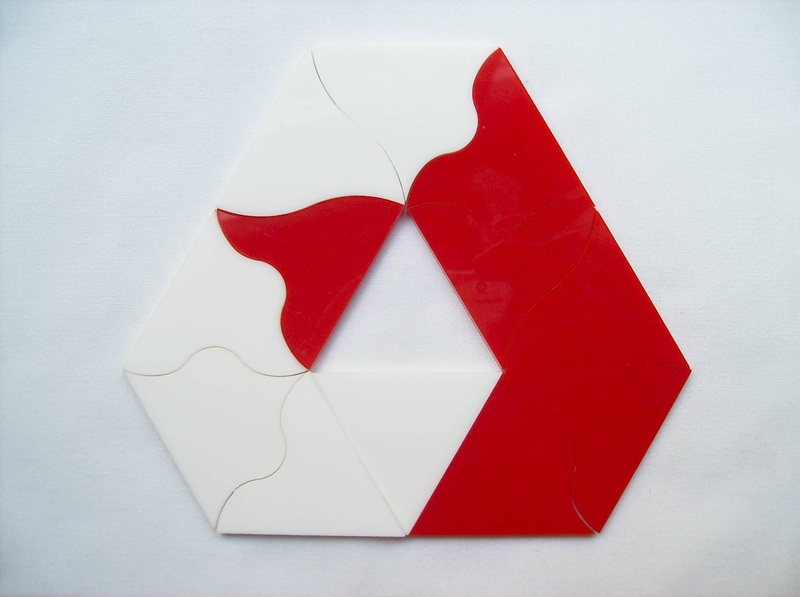 Even though there are plenty of hexagon solutions to keep you entertained for a while, the puzzle offers you many more challenges with other shapes. Another great feature is that it's also possible to play a few multiplayer games with the set. The rules for these are presented in the included booklet. As you explore a plethora of interesting challenges in the booklet, you face different types of tasks with specific rules and requirements. 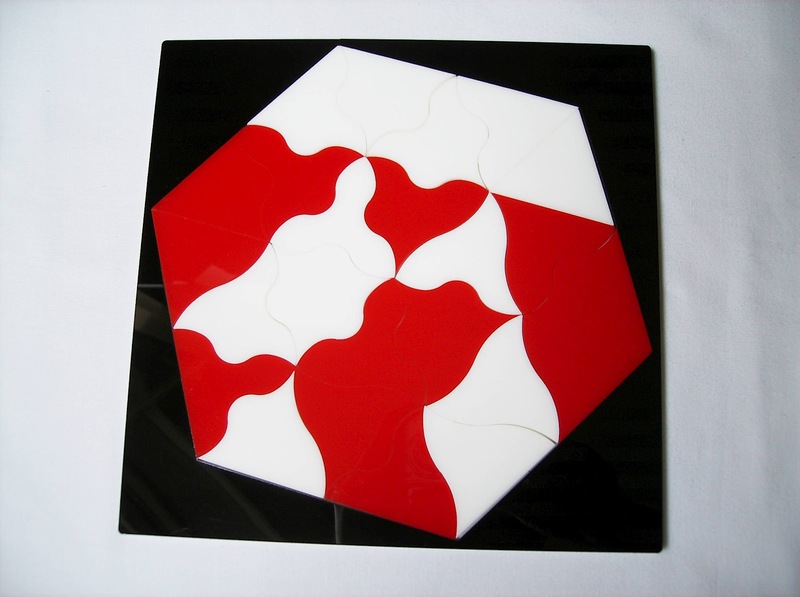 The first of these are a set of regular shapes in which you need fewer tiles to solve. The given challenges are presented as a straight-edge shape with straight contours and the hard part is figuring out which ones you need and how the internal contours are organized. In these challenges, it's not required to solve them in a checkerboard color scheme, although some of them do have this possibility. Below, I show a couple of these shapes, one with 16 tiles and another with 22 tiles. Another interesting challenge that takes advantage of the different types of contours is the "Pieces of eight". 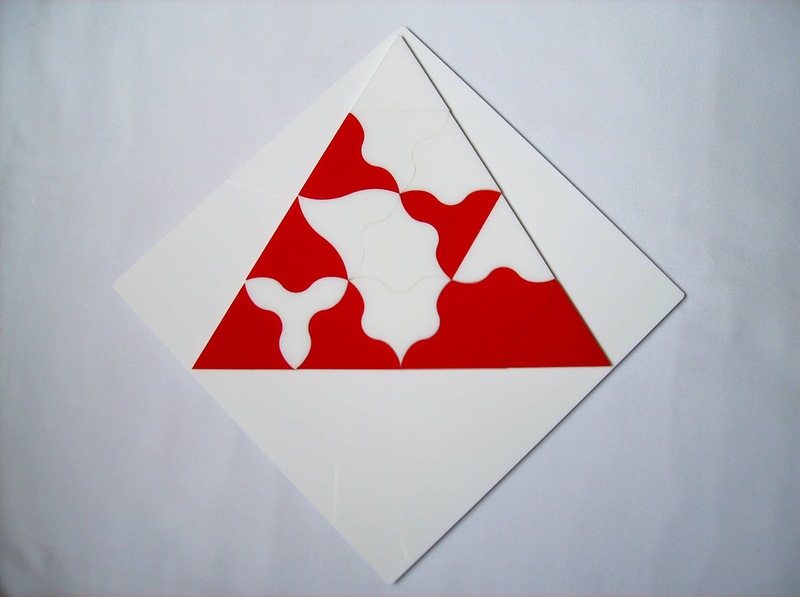 You are given several eight-tile symmetrical shapes, where it's possible to solve simultaneously, the same shape with three different contours (straights, hills and valleys). Contrary to what you may think, this is rather tricky to accomplish, even after you separate the types of contours. For example, the shape I selected to solve, a diamond, took in each contour shape, one single piece that didn't have any contour for that shape. In other words, the all straight edge diamond shape has in its interior one tile with two waves and a valley; the all hills edge shape has one tile with two waves and one straight; and the all valleys edge shape has one tile with three waves. You can see this better in the photo below. The next challenge that I've tried was also quite tough to solve, as getting the right tiles for each shape is harder than it looks. "Four of a kind" requires you to use all 24 tiles, except you'll be using them to build four shapes of six tiles each, simultaneously. The interesting part is that the shape you choose has to be the same in all four copies, but each with one of the four types of contours. 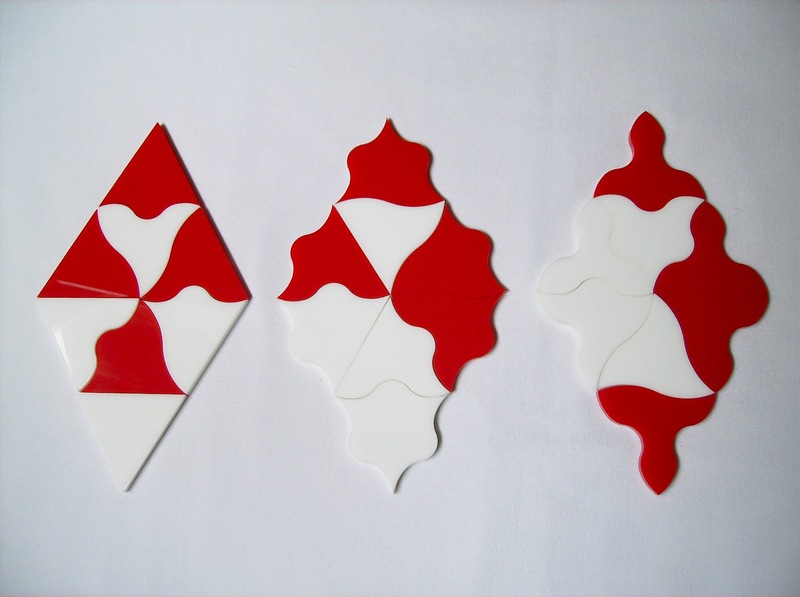 The first obvious thing in this challenge is to separate the tiles that have the same three-edge contour, as they will belong in their respective group. 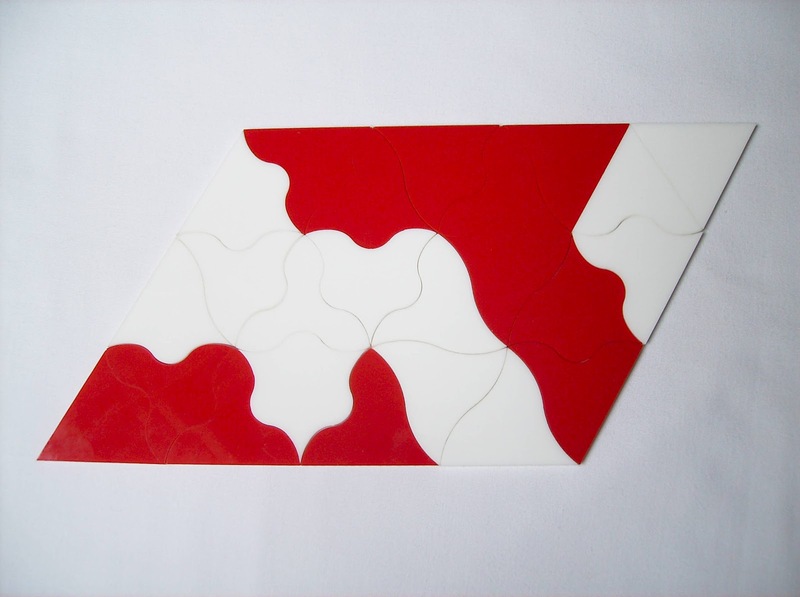 The rest of the shape within each contour type can have tiles with one or two of the same contours. The booklet gives you three examples, but there are a total of 12 to discover. As seen below, I made the challenge for the hexagon shape. A variant of the "Pieces of eight" challenge, the "Double delights" is the hardest challenge I tried. 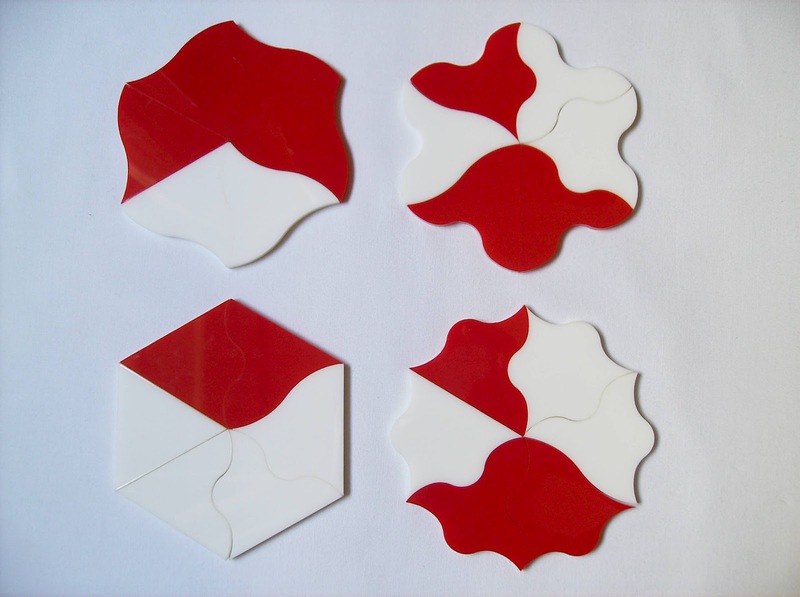 You are given several shapes of 12 tiles to choose from. When you do, try to solve that shape with straight outside edges. The hard part comes next, when from the 24 tiles, 12 are for the same shape with hills around the perimeter and the other 12 are for valleys. These two have to be solved simultaneously. Below, you can see one of these shapes with the above requirements. Note that in the shapes with the valleys and hills, the inner borders have different contours from the outside ones. As I understood, only the outside borders are required to have hills or valleys. And finally, the last main challenge. 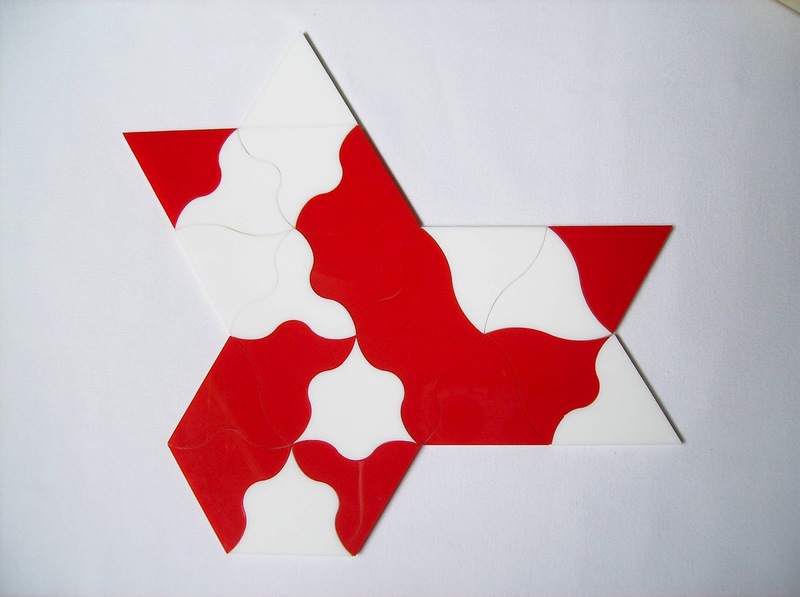 This one makes use of all 24 tiles, but the goal is to build different shapes, other than the hexagon. You are given figures with 14 unit edges of perimeter and many others with 16 unit edges. For reference, the hexagon has 12 unit edges of perimeter. Although these are quite hard to solve, I still think that the "Double delights" is the hardest challenge. 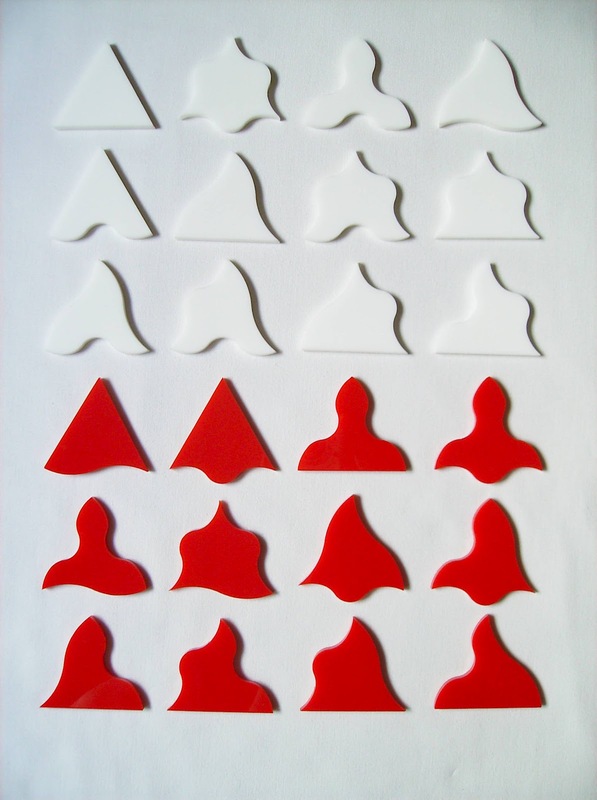 Below, you can see one of such figures (14 unit edges). If you like to explore puzzles mathematically or to discover new solutions, Trifolia is an excellent puzzle to do this. The figures you see in the booklet are not all the possible solvable ones. There are many more, and finding them out for yourself is part of the beauty in this puzzle. I have truly enjoyed playing with Kate's Trifolia and solve its many challenges. I know I've only scratched the surface and that there are many more to solve. This is definitely a puzzle to have around and play continuously trying to find other solutions. One of the best puzzles I've reviewed this year. Availability: Trifolia can be bought directly from the Kadon Enterprises website for $55 USD. You have a choice of bold colors (red/white) or mellow with see-through green and purple. I would love to see other color combinations, but that's probably depending on the available materials. 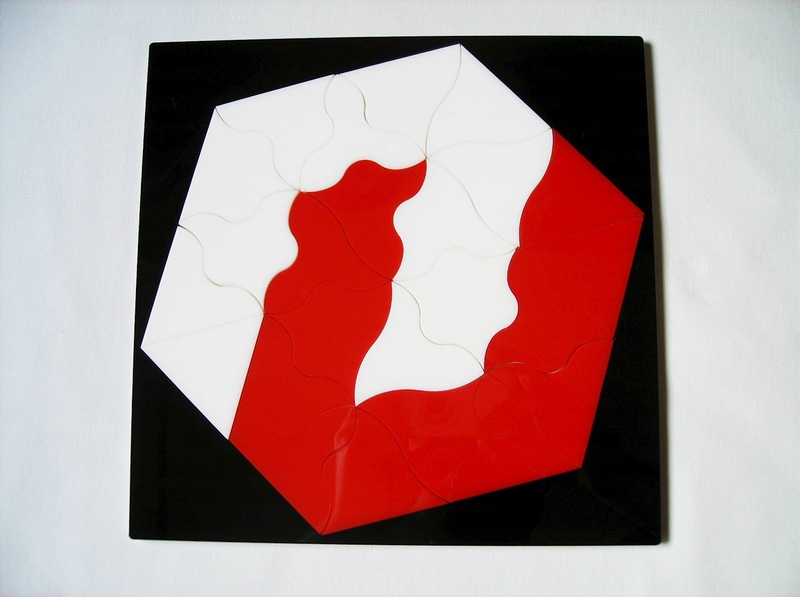 Kadon Enterprises also has a wide selection of other great puzzles. What a beautiful, perceptive, intelligent review, Gabriel. Well done, and you did a great job solving those thorny challenges. I like how you showed sample solutions. Did you notice that some have color symmetry or opposite-color symmetry and complementarity? Trifolia has the soul of yin yang. Happy puzzling!